Before we begin with the trending ideas for Gardens, it is important to look at the economic scenario we are faced with today. The reason is simple. The times that we live in, greatly influence the choices that we make. And those choices define us and the homes and gardens that we live in. The whole of Middle East region is in an economic turmoil. Oil prices are nose-diving and inflation is at an all time high. Liquidity has becoming tight. Some economists call this a silent recession. Within this toughening scenario and forecasted reality, lifestyle still does not come to an end. We are all going to be working hard to produce results and want to come back to a comfortable, convenient, harmonious home that nurtures and relaxes us to start the journey the next day. We wish to spend quiet time with our family and entertain friends. Celebrations will not stop as we all love to celebrate victories and special occasions. The writing on the wall is – Spend wisely and focus on “The total cost of ownership”. 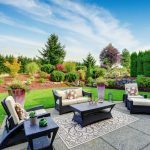 In case of a landscaping and a gardening project, this includes estimating a five-year maintenance and upkeep cost break-up, the cost of initial installation, hidden costs, etc. It is better to take an overall view, as opposed to the ‘penny wise, pound foolish’ approach which is a knee-jerk reaction to such an economic turbulence. 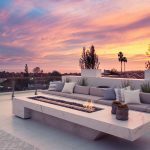 The discerning buyer will want to know substantiated answers to ‘What will allow us to maintain the garden over a long period of time?’ They will choose drought resistant plants like Date Palm, Cycas palms, Zamia and Succulents will be used often. Perennial bushes like Bougainvillea, Thivetia, Oleander will replace seasonal plants. For large plots, large quantity of grass will be avoided. Designers will improvise to incorporate more hardscape, pebbles and mulch. Grass is hard to maintain and needs a lot of care. Side pathways are narrow and have a lot of shadow generally due to both villas standing besides each other in close proximity. Grass is not a good option in such narrow shaded areas. Paving with some pebbles and plants that can grow in shaded areas may be a great option. With oil pricing going down and a silent recession setting in, liquidity will likely be low. People will think about creative ideas to lower their budgets. Use of less water saves on utility bills. Tiling and paving will be extensively used. Using artificial grass instead of real turf, use of paving, decks and pebbles, will lead to lower costs of water. 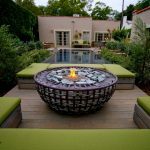 The initial cost of such gardens may seem high but over a period of time, there will be significant savings on utility bills. Zen and minimal gardens with clean lines will keep things simple, elegant and lower budgets. 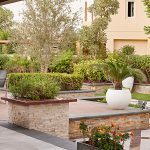 Natural stone like Travertine, Sandstone, Limestone are porous materials and absorb salts from the ground and leave a white discharge of salty effervescence on the surface, making the stone look very weathered within a short period of time. Sealants are needed to protect all natural stones. Very natural looking outdoor ceramic tiles are available and they will not need sealants. Each material has its pros and cons and it is important to understand that before making a decision. Many will move toward modern and minimal design. Symmetry, groups of plants, clean-cut hedges and simplicity in color will be the preference. Neutral colors; grey, beige, white, black, brown, will be the trend du jour. Simplicity in design with use of a lot of wood and natural materials will make the garden harmonious. Planting large trees in critical places to highlight the garden may be a great idea. Use of steel, glass, metal, abstract pots and sculptures to make a statement would be considered a great investment. A garden comes alive with such features when they are large enough to match the expanse of the architecture and the style. Lighting is what makes a garden come alive. Wall features, water falls, trees, plants, pathways, steps, seating, shade structures all need to be highlighted. The overall ambiance is created by lighting. Dim, ambient, concealed but effective mood lighting will be the way forward. It will no longer be considered a cost but an investment as LED lighting largely reduces the energy consumption. Cost of ownership can be lowered when you can maintain the garden easily. Design will be critical to making low maintenance garden and many will invest in such design. Choosing the correct material will be the key to this. I hope you found this article useful. Please browse through the website for more landscaping ideas.